The all-shimmer incarnation of Morphe’s most-wanted 35OS palette, this 35-pan palette represents astonishingly good value, with a spectrum of warm, wearable shades for creating an array of subtle to smouldering make up effects. The eyeshadows are very pigment and there is such a range of wearable everyday colours. 100% recommend. Amazing pigment, nice colours but only thing is when applying it you have to dig into the pan and also some of the orange shades stained my arm for a day. Omgggg the best colours ever! Amazing pigmentation and so easy to use, such a brilliant pallet! This is one of the first Morphe palettes that I’ve brought. Hands down it’s amazing. Don’t think twice just buy it. The eyeshadows are so pigmented. There’s so many and pan size is decent. The only problem is that they last forever. So I don’t have an excuse to buy more makeup. Good quality and good value for money. All colours in this pallet are shimmery so can be helpful to put a matte shade underneath and the colours from this to build on! First Morphe palette and words can't describe how amazing it is. The colours are to die for and the pigmentation is incredible; an excellent buy! This palette is just perfection, the shimmers are just incredible. I used to use Mac and Charlotte Tilbury, but they cannot touch these for pigmentation and the ease they go on. Finally, a glitter palette with pigmentation! This is my first Morphe palette and definitely won't be my last. The pigmentation of the colours is excellent plus it's such good value, I can't recommend this product enough. SO happy when this finally came back in to stock! just received it and the colours and pigmentation are AMAZING! A must. This palette is a dream come true for all the shimmery eyeshadow lovers. I received this yesterday and already am in love, the colours are SO pigmented and shimmery! Definitely try and get your hands on this palette when it comes in stock. It's so worth it! When is this palette going to be restocked?! I'm desperate!!! Need for a gift as well!! AMAZING. The pigment is incredible. Worth the money for sure. This palette is amazing, the shimmer and the matte shades are so pigmented. I bought one for myself and one for my friend since she loved how wearable the shades are. Will defo be purchasing again! Love this product, 10/10 recommend. Lovely colours, easy to apply, and blend well! Such an amazing palette! The eyeshadows, both matte and shimmer as so creamy and pigmented! There are so many wearable colours to use to make a perfect eye look! Will definitely be purchasing again! Ho acquistato questa palette perché adoro Morphe , la qualità dei suoi prodotti ad un prezzo molto accessibile..che dire non sono mai rimasta delusa neanche di questa palette che è veramente completa per fare tanti trucchi nei toni marroni neutri e smoky eyes .gli ombretti sono pigmentati e facili da sfumare..consigliata. ***** I bought this palette because I love Morphe, the quality of its products at a very affordable price... what to say I have never been disappointed even in this palette that is really complete to do so many tricks in neutral brown tones and smoky eyes. they are pigmented and easy to blend... recommended. Bought as a present for someone and it is even more shimmery than it looks in the photos. Such a beautiful palette for such a great price! I love it! Love this palette. Great value for money and the shadows are really pigmented. It does have quite a bit of fall out which is why I gave it 4 out of 5. Definitely a great buy though! most amazing, pigmented shadows. so good for the money, 100% reccommend! I bought this for my friend for her birthday, she loves it and I got to swatch the shades and they're beautiful! This is beautiful and great quality for the price, I recommend a spray of setting spray and pressing on the colours rather than buffing in, but I use this literally all the time! Its a great starter palette to play with, and if you know anything about morphe you know their shimmery shades are the cream of the crop so I would definitely recommend this morphe palette over others! I tend to have trouble finding eyeshadow with a great pigmentation. But this pallet is amazing. I had never tried Morphe pallets until I brought this one and always heard good things about them. And I am seriously glad I invested. Can't wait to get another one! All the shades are so pigmented and buttery. I tried this palette at a friends house, and since i haven't been able to forget about it, the craze is real - the colours are amazing, the shimmer is beyond perfection and the texture of the shadows is incredible. Perfect for layering and blending. I have always been using Chanel and Dior quads, as i wasn't been able to find eyeshadows with both great quality and great colours and shimmer. But Morphe really does the job! Great quality - especially for the price - which is little under half the price of a Chanel quad. I have now purchased this myself, and i can't wait to get my own palette. Buy this while you can, you will not be disappointed!!! This palette is so beautiful and the colours are extremely pigmented. Buttery smooth and super pigmented! So exited about this palette. I need this product soo bad and I've been waiting for ages now! Until when will i wait?????? When are these little miracles going to be back in stock? Why do we have to wait so long? Please do sth to re-stock a.s.a.p please! 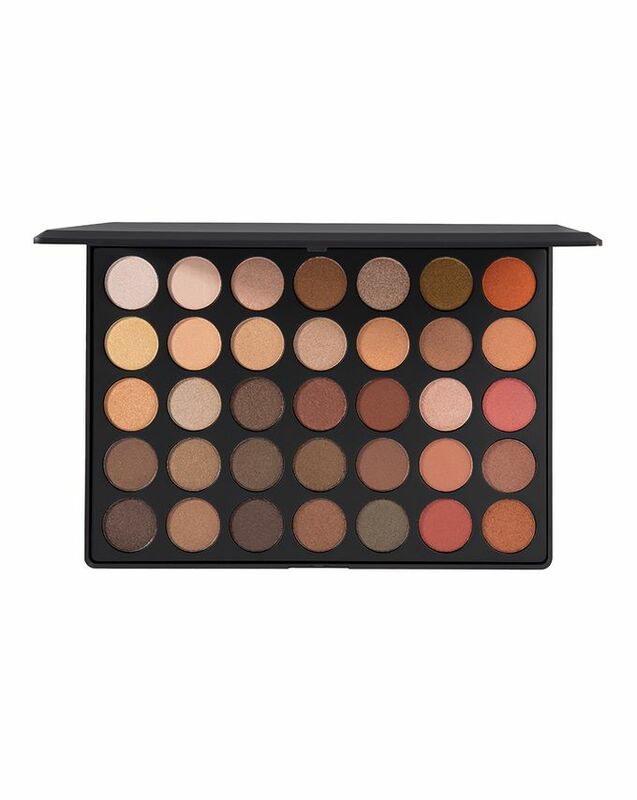 I have been awaiting the much coveted arrival of the original Morphe 350, but it is always out of stock - why?! So I ordered both this palette, the 350s and the all matte version the 350m. Can I just summarised this palette: PIGMENTED! I was so pleasantly surprised. Yes some colours are very similar but this happens in several palettes not just Morphe. I adore warm colours and this is perfect for the fall and winter season to add glow and shimmer to your eyes. I can't wait to receive the 350 m so that I will have corresponding matte colours! I am so late to the party with Morphe but the quality is truly very impressive for the price. Can I suggest to keep checking Cult Beauty for Morphe. I was constantly checking the other day and to my surprise these two palettes were in stock! I'm love with this palette! All the colours are so pigmented and buttery. Such good value for money as well. Very happy.